Creative’s rather active in the speaker game once more, with a new Bluetooth Portable Speaker named FRee. Unlike what the name suggests, it would set you back $149, but in exchange Creative wants to help you set your music free. Creative has established itself as one of the top choices of the portable Bluetooth speakers with the success of the Roar and Roar 2. The Free is targeted at a more active audience, where durability might be a higher priority compared to audio fidelity. The new speaker sports an active lifestyler design and is designed to be the size of the average sports bottle, which translates to easy portability. The Sound Blaster FRee’s IPX4-certified splash proof design is ideal for enjoying your music without getting it wet. But wait, that’s only splash proof, for more durability, you might want to consider the IPX7-certified water proof UE Megaboom instead. The Sound Blaster FRee weighs 466g, measures just 71.1 x 200.8 x 68.5mm, and looks good in both the vertical and horizontal orientation. However, to maximise the audio prowess, you might want to lay it flat on your desk to allow for an accurate stereo separation. The sound is powered by two custom-tuned Neodymium drivers and twin passive radiators for full-range sound. 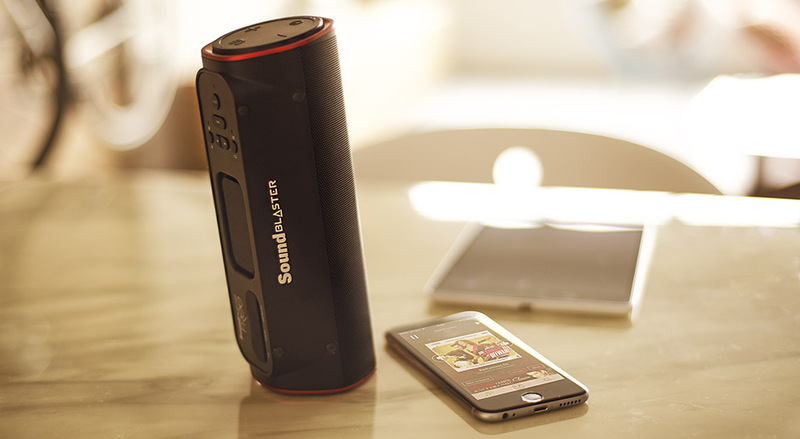 For other features, Sound Blaster FRee’s built-in MP3 player lets you play your music without pairing to an external source. With capacity support up to 32 GB, you’ll have non-stop hits to keep you entertained for hours. It supports pairing to two devices, or multi-point Bluetooth, and it boasts HD Voice for crystal clear voice comms. Lastly, if connected to your computer via USB, it serves as a digital sound card with Creative SBX Pro Studio technology. The Sound Blaster FRee will be available in July for S$149 at all authorized Creative resellers. Good to see our local Creative getting back to their speaker roots.